Promoting Economic Prosperity is the core of our mission at the Chamber. To achieve it, we recognize it's shared responsibility of many. The Chamber has made it a priority to work with area municipalities and other relevant organizations to develop strategies that promote business retention, encourage entrepreneurial activity, attract new businesses and drive overall regional prosperity. These partnerships allow us to support and facilitate development projects that enhance the growth of our community. We provide businesses and entrepreneurs ready access to resources and agencies to help them succeed. 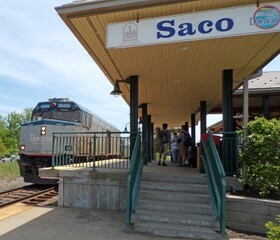 The Biddeford+Saco region is experiencing significant economic growth. Over $200 million dollars of investment has occurred in the past couple years and more is expected. The Mill District, once abandoned, is now the center of activity with market based housing and over 150 new businesses. Plans are being developed to create an intermodal transportation center with public buses, the DownEaster Amtrak train, Zip cars, cabs and bicycles all in one central location. 3 Lincoln Mill, the former sight of Maine Energy, an 8.5-acre parcel on the outer edge of the Mill District has been cleared and is ready for development. In the near future, this area will feature outstanding urban living, retail shops and restaurants.